The paternoster is the most existential of contraptions. In theory, you could stay on it forever. Recently, while in my basement digging through old shopping bags full of philosophy books, I came across a flaky brown paperback titled Moral Philosophy: A Program of Study for Honors Students. Published for the Swarthmore College Philosophy Department in the 1940s, it was an 81-page outline for a 16-week seminar—replete with potential honors exam questions. A remnant of my father’s signature from 60 years ago was visible on its heavily chipped front cover. The book is a casual family heirloom, passed to me during my own Swarthmore years. My father, Walter Scheuer ’44—like my mother, Marge Pearlman Scheuer ’48—had been an honors economics major with an interest in philosophy. I will turn it over to my son, who is currently studying philosophy at Reed College. Moral philosophy wasn’t exactly on my front burner when I arrived at Swarthmore in fall 1971. I’d entertained vague notions of becoming a writer and considered majoring in history. In that first semester, I enrolled in Paul Beik’s Modern Europe. The kindly Professor Beik encouraged me to continue in Clio’s direction. The following spring, I was less impressive in Bernard Smith’s Later Medieval Europe, chosen mainly to test Smith’s reputation as a great and demanding teacher. He was one. I was a good enough student, no more. After an intellectually lackluster high-school career, reading philosophy pried open my mind and filled it with questions. 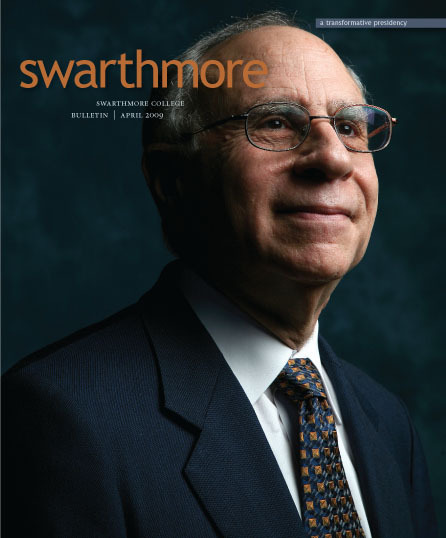 Nearly everything I learned of any importance was learned at Swarthmore—especially in those philosophy courses and seminars. Nothing else compares. Eventually, I became aware of the Philosophy Department’s distinguished history. The names that echoed through Trotter and the old Parrish Annex, where the department was housed in those days, included Roderick Firth, Monroe Beardsley, Maurice Mandelbaum, and Brand Blanshard. By the 1970s, Oberdiek, Hugh Lacey, Richard Schuldenfrei, and Charles Raff formed a small but very able crew. There was also a steady trickle of visiting professors, cannily selected to show off the superiority of Swarthmore’s department. During sophomore year, I came to equate great moral questions with the taste of strong black tea, which emerged from Gil Stott’s picnic basket at 4 p.m., when we met for ethics class in his Parrish Hall office. There, I first made contact with Aristotle’s Nicomachean Ethics and other great works of moral philosophy. I was one of the hundreds of students whom Gil befriended over the decades. During my final semester, in spring 1975, the elegant mysteries of Kant were revealed —or, at least, some of them—in Oberdiek’s attic study. The special honors seminar on Kant included five philosophy majors, Hans, and Professor Ken Sharpe from political science. This is how, in my last months at the College, I came to read much of Kant’s Critique of Pure Reason—along with James Joyce’s Ulysses (in David Cowden’s seminar The Modern Novel) and a dozen or so other works by Joyce, Henry James, Joseph Conrad, and Virginia Woolf—while plotting my future and preparing for honors exams. I enjoyed it, exams and all. The highlight was an oral exam on Kant with Lewis White Beck, a leading Kant scholar and translator. As a convergence of inquiring minds and great books, that Kant seminar was the apotheosis of the Honors Program—the unrecorded high point in the history of learning at Swarthmore College. Not of genius, but of learning. Within the dense labyrinth of the Kantian critiques, I found a compelling way of concerting mind and nature. There are other great ideas in Kant, but above all, he pointed the way toward the modern synthesis of reason and experience as building blocks of knowledge. By the end of that semester, I couldn’t exactly sight-read Kant’s symphony, but I could at least hum it. Despite all of this deep thought, an academic career wasn’t in my future: I’d failed to persuade myself that philosophy was my calling. So, after a year of writing and research, I enrolled at the London School of Economics (LSE) to study political theory. In addition to being in London, the LSE had another singular feature that Swarthmore had lacked—a sort of elevator, known as a “paternoster,” that had no door and never stopped. The paternoster, still found across Europe, is the most existential of contraptions. You hop on and off at just the right moment to avoid death or dismemberment. In theory, you could stay on it forever. When your moving platform reaches the top floor, it shifts to the down shaft and begins its descent. At bottom, it shifts again, returning to the top, ad infinitum. Not a bad metaphor for studying philosophy, come to think of it. Some years after London, and a brief foray into journalism, I became a philosophy graduate student at Columbia. One of the attractions was the legendary Sidney Morgenbesser, who had previously taught at Swarthmore—well before my time. I did well at Columbia but still felt out of place in the world of academe. My final wake-up call came when I went to see Morgenbesser about a paper that he’d returned with a grade of A-minus but without comment. I stopped by his office hoping to talk it over and maybe learn something. He received me icily, assuming, as I later realized, that I’d come to argue my grade. Grade grubbing was another thing Swarthmore hadn’t prepared me for. I had never discussed a grade with any Swarthmore professor. What was there to discuss? When it dawned on me that Columbia—and most of the academic world—was different, I returned to writing. I recently taught a course on media and political ideology at New York University and found it challenging and stimulating. But I didn’t have the feeling that I’d missed my calling. My father had pronounced scholarship a “saintly profession,” but I found this judgment to be unsettling and, at times, quite wide of the mark. And I really wasn’t interested in sainthood. Looking back, the only drawback to studying philosophy has been a certain beclouded incapacity to perceive the world as it really is—apart from the conceptual and normative frameworks that philosophy imbues even in nimbler minds than mine. This debility isn’t a function of age; I noticed it as soon as I descended from the Olympus of Oberdiek’s attic. It was probably triggered the moment I opened Tillman’s Introduction to Philosophy and discovered Descartes’ First Meditation. We may never glimpse Kant’s “Ding an sich”; but if you can pump gas without your mind drifting to the question of synthetic a priori truth, you’re ahead of me. Nonetheless, philosophy is an excellent foundation for many careers, including law, politics, business, film theory, bartending, and most kinds of teaching or writing. I’ve found it indispensable for a species of quasi-academic nonfiction, which is not currently in much demand. But struggling to see things exactly as they are (if they are exactly anything), has its rewards. Hopping on and off the paternoster of pure thought, I may not have done philosophy much good; but it’s one way of getting to the next higher level. New York writer Jeffrey Scheuer ’75 is author of The Sound Bite Society: How Television Helps the Right and Hurts the Left (Routledge, 2001) and The Big Picture: Why Democracies Need Journalistic Excellence (Routledge, 2007). For more information on Scheuer, visit his Web site at www.jscheuer.com. To view a paternoster in action click this link: http://vids.myspace.com/index.cfm?fuseaction=vids.individual&videoID=752131207. As the video loads, there may be a delay of a few seconds before it starts.